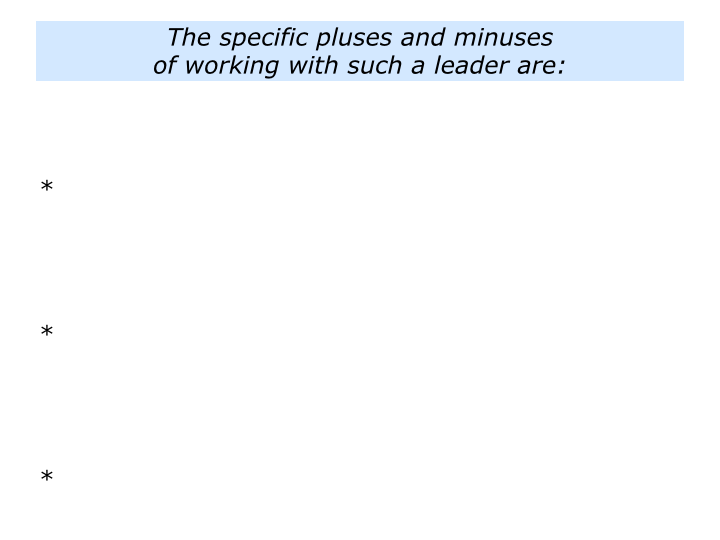 Imagine that you are applying for the role as the Number 2 to a leader. You will obviously do a lot of research regarding the person’s approach. Different people have different leadership styles, but the key is to focus on their behaviour. The way they act will affect other people each day. 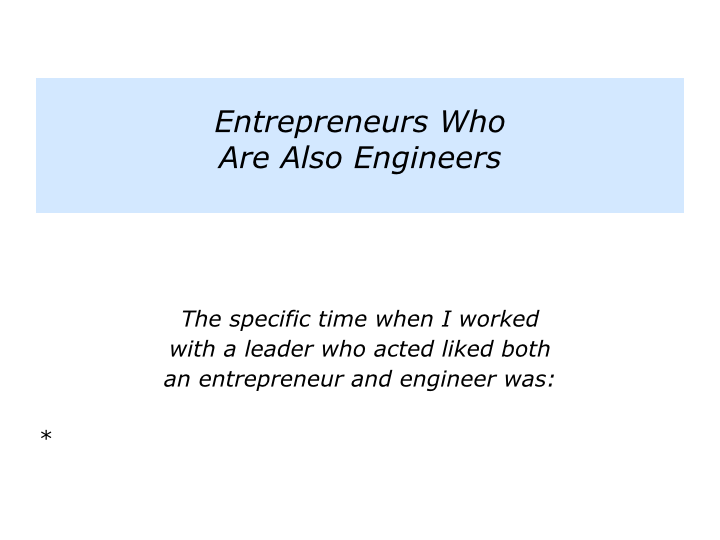 You may be working with somebody who has the characteristics of an Entrepreneur or an Engineer. Some leaders combine both sets of characteristics. They act like an Entrepreneur who is also an Engineer. These are over simplifications, of course, but they can be useful for guidance. 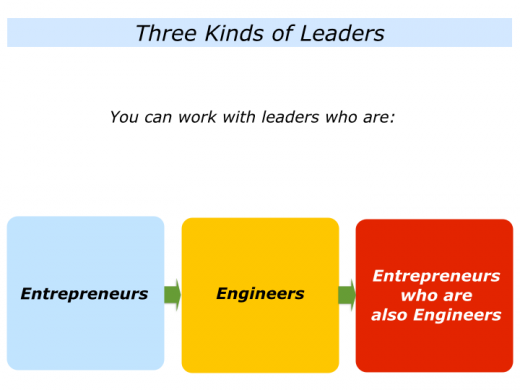 Let’s explore how you can work with each type of leader. Entrepreneurs tend to have high energy. They are brilliant in their own field and think quickly. They go ‘A, B ___ and then leap to ___ Z’. Visionary by nature, they often see pictures of ‘what good looks like’. They do not always communicate these visions to people, however, even though they think they do. Contrary to most beliefs, such people actually do follow a process, but it is their own process. They follow these principles intuitively, however, and sometimes it is hard to communicate these to other people. 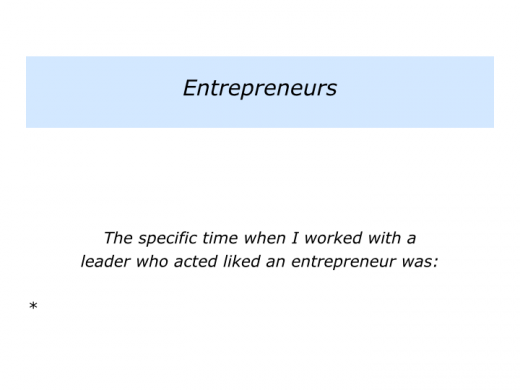 The entrepreneurial style is associated with business. But some artists, actors, inventors, scientists, chefs, knowledge workers and people in other professions demonstrate similar behaviour. 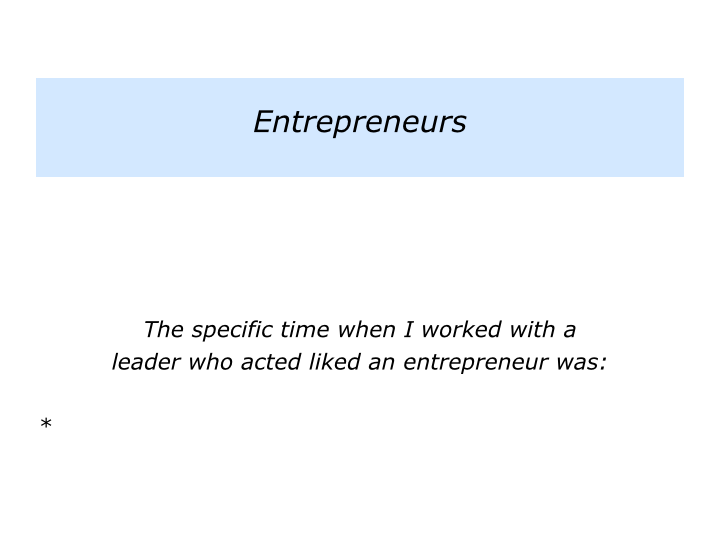 Describe a specific time when you worked with a leader who had the characteristics of an entrepreneur. 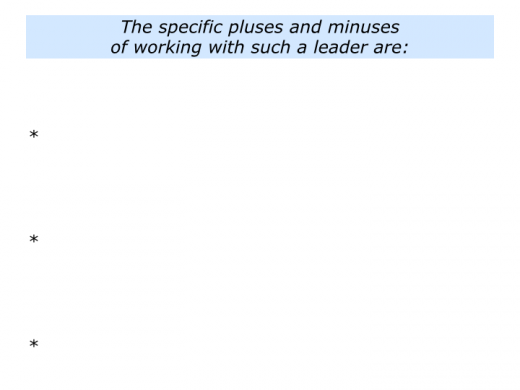 Describe the specific pluses and minuses of working with such a leader. 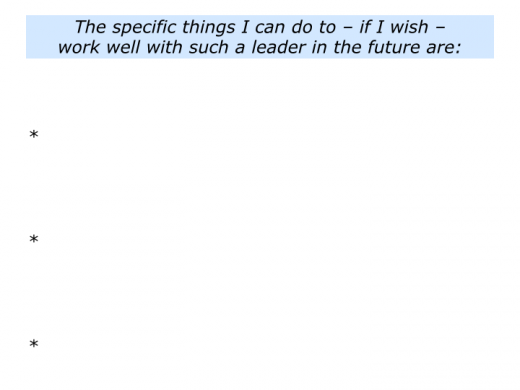 Describe the specific things you can do to – if you wish – work well with such a leader in the future. Engineers want to make things work. They tend to be methodical and follow a structured process. They go ‘A, B, C, D, E …’ and continue in a systematic way until they reach ‘Z’. They expect others to adopt a similar approach and be able to explain issues in detail. Good engineers focus on the end goal. They then apply their expertise to implementing processes and tackling challenges on the road to achieving success. Sometimes they can become fixated on issues, however, an approach that has both pluses and minuses. On the upside, this approach may be exactly what is required to develop consistency across an organisation. On the downside, this can lead to micro-management. Some engineers move on to developing a style of managing by outcomes, rather than managing by tasks. They develop a culture in which people take responsibility for following the key principles and delivering success. Describe a specific time when you worked with a leader who had the characteristics of an engineer. 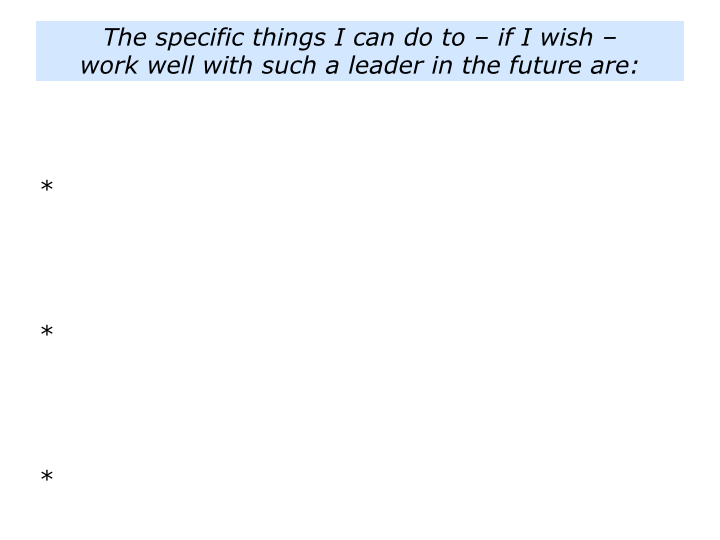 Describe the specific things you can do to – if you wish – work well with this kind of leader in the future. Some leaders combine both approaches. The entrepreneurial side is inspiring and focuses on the picture of success. The engineering side is systematic and sees minute details on the road to achieving success. Entrepreneurs who are also engineers can be demanding. Working with them can be exhilarating, but is like a giant switchback ride. The leader can shift quickly from focusing on the vision to swooping down into the detail. This can be intimidating for some people. Such leaders often attract team members who follow them from project to project. People are willing to put with both the pluses and minuses involved. They know they will be part of exciting teams that often deliver the goods. To clarify the leader’s picture of success and then play back their understanding to ensure they have the same picture. To clarify and follow the overall Dos and Don’ts for working well with the leader. To get some early successes and then proactively keep the leader informed about their progress towards achieving the goals – otherwise the leader might start interfering. To recognise the leader might change their mind without telling them – so they keep checking on the evolving picture of success. To do whatever is required to deliver the picture of success. 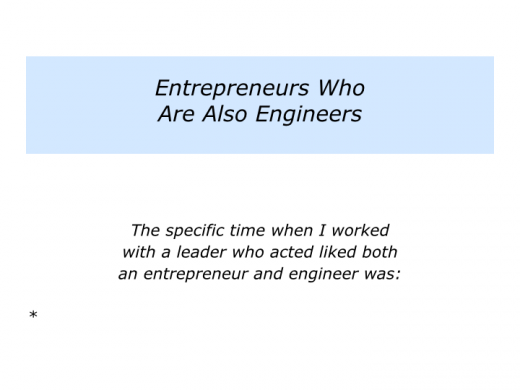 Describe a specific time when you worked with a leader who combined the characteristics of both an entrepreneur and engineer.